I found another book in the series and decided to read Good Night Rhode Island by Adam Gamble and Anne Rosen because Arya has actually been to the state of Rhode Island. The front cover of Good Night Rhode Island shows a little boy and a little girl sitting on a bed looking out their window at a coastline. Although the surroundings are nondescript, I thought the scene was influenced by Ocean Drive and the Cliff Walk in Newport. 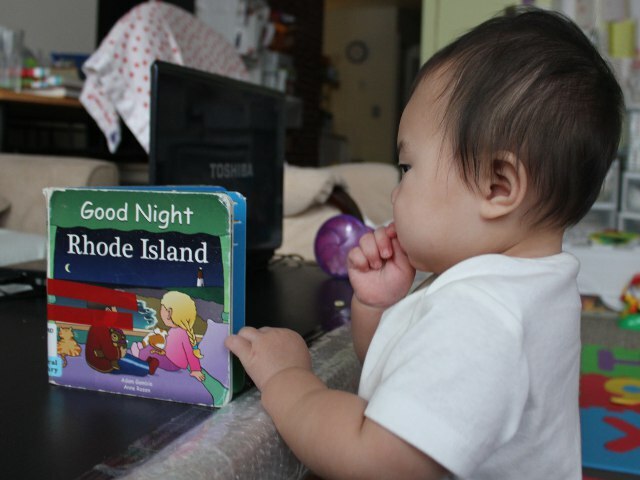 The book relies on the standard format of the Good Night series with each page dedicated to a different aspect of the state of Rhode Island. As with other books in the series, some pages are interesting and memorable while others seem more like filler. With lots of unique locations–Roger Williams Park, Narragansett Bay, Waterfire Providence, Pawtucket Red Sox–the book is interesting for older children who have been to Rhode Island. Some of the pages–like the two pages of a beach–could be about any location. Large, colorful pictures kept Arya’s attention throughout the entire book. As with other books in the series, she cared less about the specific locations as opposed to interesting sights and colors. The large giraffes and big rooster were the most interesting for my daughter. Good Night Rhode Island is ideal for any children living in or planning to visit the state. Babies and young toddlers will enjoy the images regardless of where they live. Good Night Rhode Island costs (including shipping) under $10 new and under $4 used from Amazon.